With fighting games all the rage these days it seems like the crowded genre doesn't have much room for many newcomers. We've already had major releases for the Soul Calibur, BlazBlue, Mortal Kombat, Virtua Fighter, and Street Fighter franchises, and on the horizon there's a Tekken release, a new Dead or Alive game, and a few HD remasters of fighting games from consoles past. Atlus would need to really deliver on the goods if they wanted fighting game fans (and even Persona fans) to sit up and take notice of a Persona fighting game. Well they were off to a good start getting Arc System Works (makers of Guilty Gear and BlazBlue) to develop the game, and the final product has turned out nothing short of stellar. 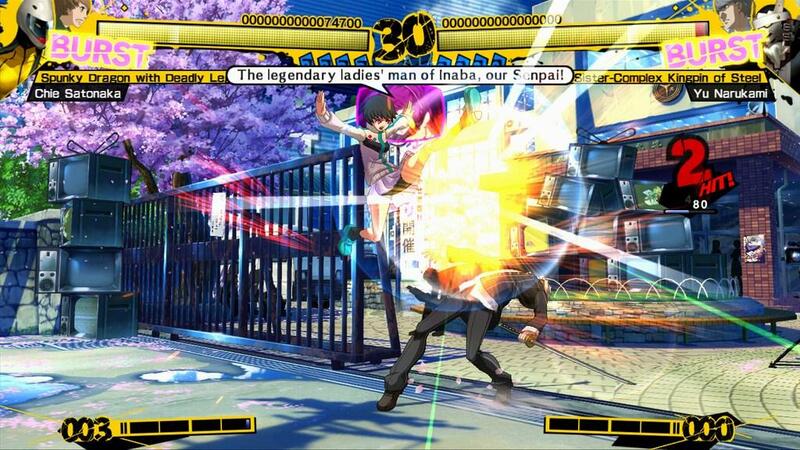 Persona 4 Arena (or The Ultimate in Mayonaka Arena) finds itself in the midst of some crowded competition and surprisingly holds its own against the best of fighters and against even Arc System Works' own properties. It's not just a competent fighter, it also manages to tell a great story and fit perfectly in the Persona (Persona 3 & 4) universe with a compelling yarn, which is something even the most staunch opponents of fighters should take notice of. Right off the bat this game is visually arresting. The sprite work from Arc System Works is absolutely phenomenal and the characters just ooze personality. The stages themselves are colorful and have plenty of style to spare. The same could also be said of the general presentation of the game. The UI and menus feel like they're a perfect fit for this game, which isn't something I'll normally comment on, but I was just so impressed by the presentation of this game that I'll happily mention it. The only thing that makes the interface better is the accompanying music. 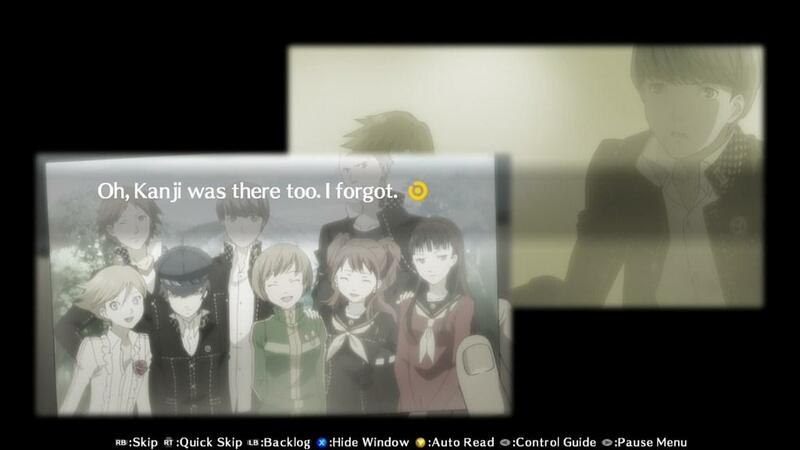 Shoji Meguro's style fits this game perfectly, having a track like Electronica of the Soul for the character select screen is a fantastic choice, and being able to duke it out to Battle Hymn of the Soul from Persona 3 is one of those (and I'm going to sound like a total douche with this one) transcendent moments in gaming where all the parts of a medium come together for what had to be my own personal 'Perfect Moment' in a game (for the record previous transcendent moments include Untracked in the original SSX, and the battle against Magus in Chrono Trigger). For those wondering how the much maligned voice acting turned out, it's actually really good and I couldn't tell the difference between the two, only by trying to play the game side by side with videos of Persona 4 could I detect much of a difference, outside of Teddy, he is only character that is noticeably different from Persona 4. The inclusion of a Japanese language track is just icing on an already delicious cake. 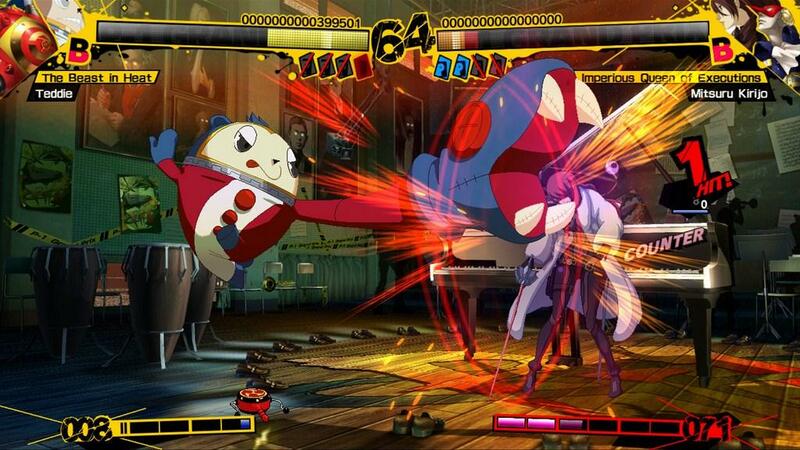 Persona 4 Arena's story surrounds the main cast of Persona 4, and a few characters from Persona 3, sucked back in to the Midnight Channel and thrown in to combat against each other by Teddie who's out to do his best M. Bison impression. Yu Narukami (Persona 4's protagonist) is visiting Yaso-Inaba for a short vacation during Japan's Golden Week, but the trip is promptly interrupted by the events of the Midnight Channel. 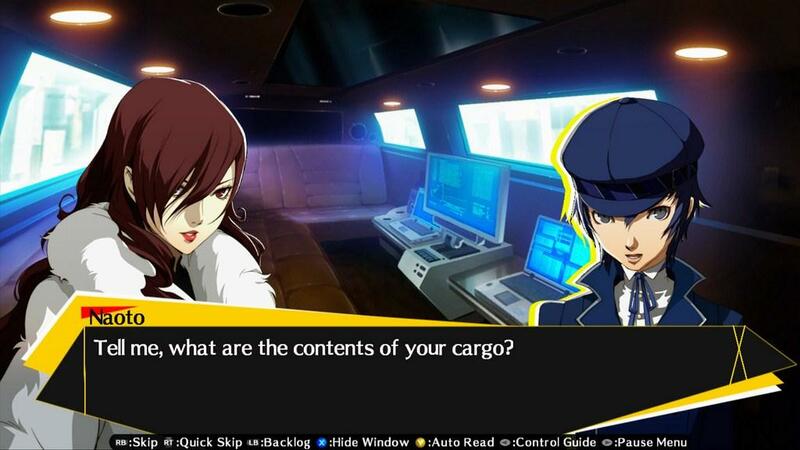 By the end of the story you've got what almost feels like a setup for Persona 5, or at least some good material to pad out the PS Vita's Persona 4 Golden that's coming later this year. But it's good to see that the story mode hasn't followed the path of previous Arc System Works fighters, where players are required to lose some bouts to complete a character's story. There are branch points but there are bookmarks that players to set to save progress, and in a move of sheer brilliance, if players reach a cliffhanger ending they can resume it without the need of a bookmark. The story features some interesting twists that I don't dare spoil, and there are some genuinely humorous moments throughout, especially for Elizabeth's story. 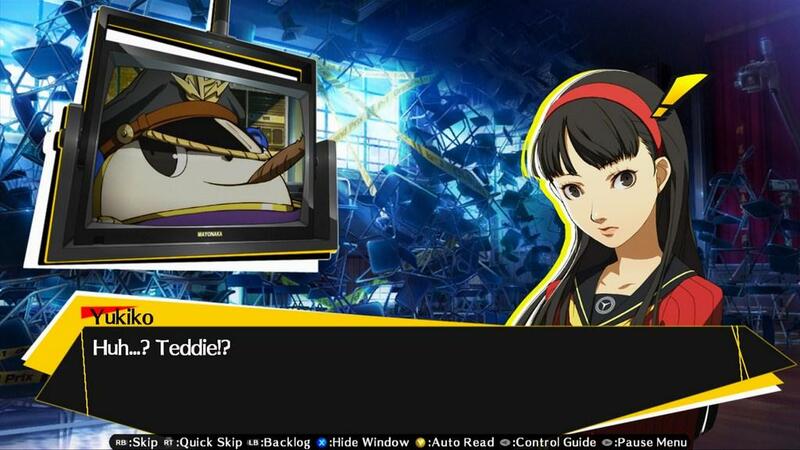 For those that like to measure a game's worth with their dollar to time ratio, the story mode alone in Persona 4 Arena will take a little over twenty hours to unlock all of the endings, and that doesn't include all the gag endings that result in some frightening stuff, like Yukiko forcing her lunch down people's throats (it's more disturbing than it sounds). 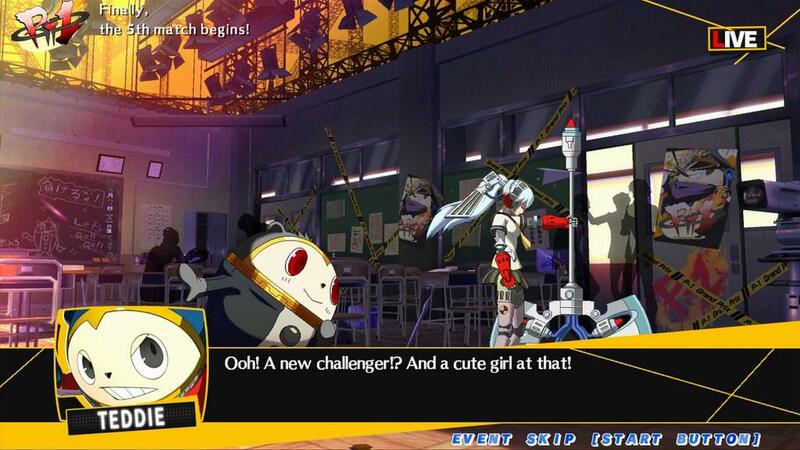 Getting to the actual gameplay, it's going to be tough to summarize what makes Persona 4 Arena such an excellent fighter because there is so much stuff this game does right. For starters it's incredibly easy to get in to, beginner level combos can be done just by simply tapping the A (Square) button and these combos can do a lot of damage. Higher level play will require the use of all buttons of course, but it's nice to see that beginners can have something at their disposal. Of the four button setup, two buttons are for the character being controlled and two buttons are for summoning that character's persona. Summoning a Persona isn't a big deal like it would be in the RPGs, they just come out to deal some quick damage, or can be used for special attacks. 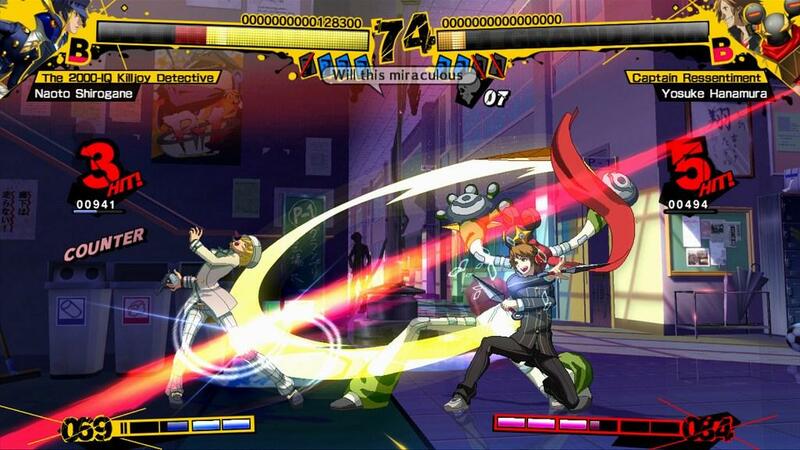 Like players, the Personas can be attacked, and after a few hits they'll be out of the fight momentarily. Having Personas in the game adds quite a bit of dimension to the somewhat small cast of thirteen fighters and might remind players of Capcom's old JoJo's Bizarre Adventure games released on the Dreamcast and PS1. Some characters in the cast also have special properties that are innate in the character or can be accessed through special commands. For example Aegis can access her Origa mode which allows her to deal more damage, gain increased mobility, and access some hidden firepower. Other characters like Yukiko can power up their elemental based attacks, causing them to do extra damage or become completely unblockable. 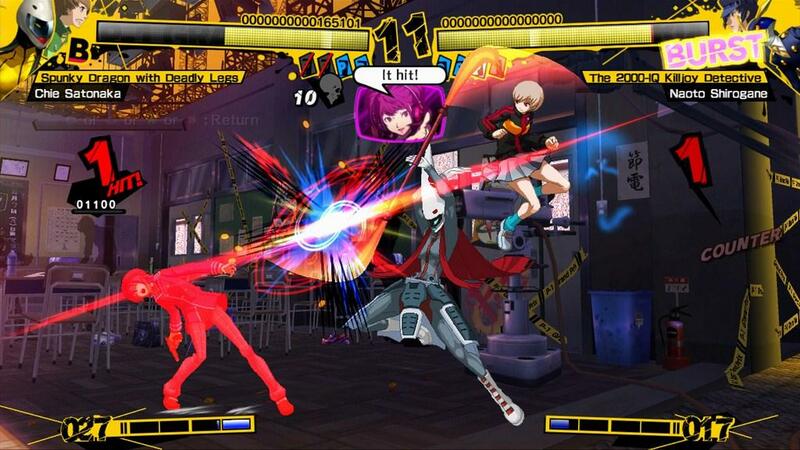 To top it off there are status effects like in the regular Persona games. These status effects can poison, root, or lower the defenses of players and are an integral part of the game for some characters, like Elizabeth. Each character also has an instant death attack that can only be activated in certain conditions, and while they are ridiculously powerful, they also leave the user incredibly vulnerable, so there is definitely a gamble taken each time they are performed, also expect some angry messages from players on the receiving end of those attacks. For those out there who aren't so fresh on their fighting game skills (mine certainly don't pay any bills), Arc System Works offers up a a lesson mode to get the basics of the game, and a challenge mode to learn the ins and outs of a character, and has a very interesting way of testing players' abilities and what they've learned. The last trial of each character isn't really set in stone, it just requires a player to do a one-touch kill, a combo that will kill an opponent at full health. The training mode is about as robust as one would expect, offering players a multiple number of ways to set up and practice their characters. There's even more content available, a score attack mode that lets players unlock new announcers, a theater and gallery mode to watch unlocked videos and view images found in story mode, and last and certainly not least, online multiplayer. The multiplayer felt lag free during my time with the game, and while I won't be reaching EVO anytime soon with my record, I felt like my bouts were lost on my own failures and not due to lag or network shenanigans. The level up system is unique, in that it almost feels like an RPG when playing through ranked matches. Players can gain experience and rank up from their starting grade of F-. This allows players to unlock titles for their character to display when finding opponents. The personal customizations (titles and the like) for online play are kind of bare-bones but it's not a make or break aspect of this game. Players can also set up online rooms that allow for quarter and tournament play, along with further customizations that can limit a win streak, or even randomizes who stays and who goes after a match. These features are a great addition, even though they don't seem like much they do a great job in allowing players to shape their own experience in the game. 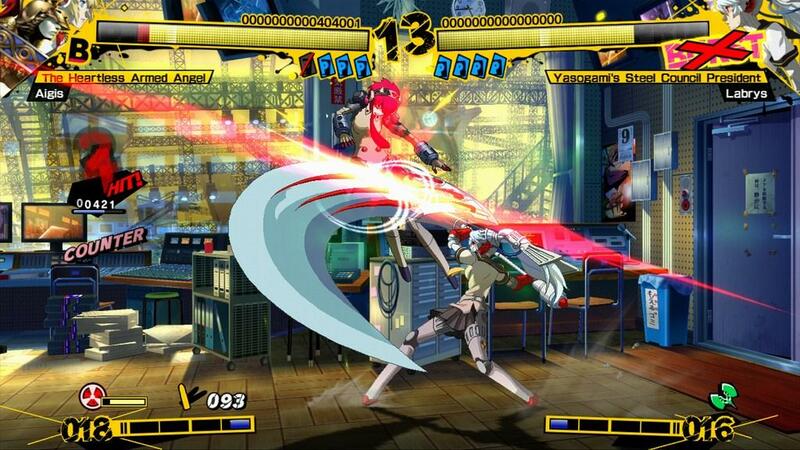 Persona 4 Arena is without a doubt one of the best original fighting games to come out in a long time. With all of the sequels out there, I wouldn't be surprised if the game resonates well with the fighting game community for offering up something new. I know that I find this game to be an absolute must play for fans of fighting games. Even though it's got that 'anime' look that is derided amongst stream monsters, Persona 4 Arena is a magnificent looking game, and offers up a lot of depth and gameplay. Really the only fault I had with the game were a few stray misspellings in the story mode. Otherwise Persona 4 Arena is one of the stand-out titles released this summer, it'll be interesting to see how support for this game amongst the community does when other games like Dead or Alive 5 and Tekken Tag Tournament 2 hit the scene. 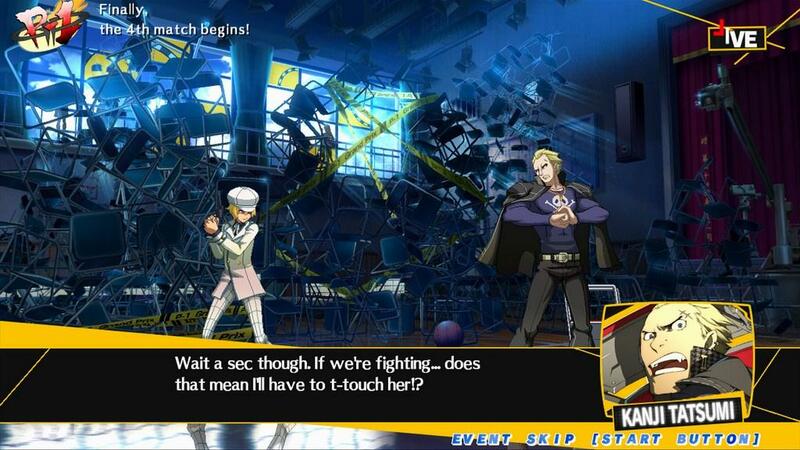 We'll see when that time comes, but for now, enjoy some Persona 4 Arena, I know I did. 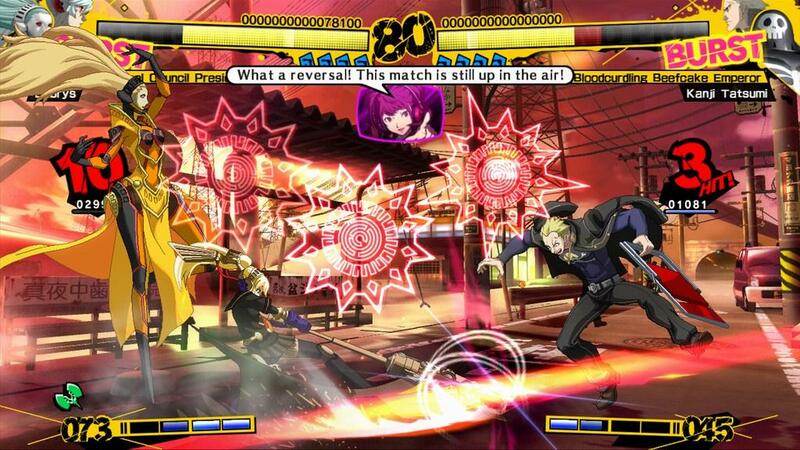 Atlus and Arc System Works have made the perfect match in Persona 4 Arena. If you play fighting games then you need to pick this game up. It's one of the most enjoyable and unique fighting games I've experienced in quite some time. Now if only I could stop being free in online matches.